Ruth Jongsma, 87, died at Good Samaritan Center in Corsica on Tuesday, November 27, 2018. Funeral service will be Friday, November 30, 2018 at 10:30 AM at Harrison Community Church (South Church) with burial following in Harrison City Cemetery in Harrison. Arrangements by Koehn Bros. Funeral Home in Armour. Ruth Jongsma was born on April 9, 1931 to Harm and Hulda (Niewenhuis) Lefers on a farm northwest of Corsica. 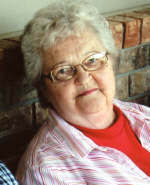 She attended country schools and graduated from Corsica High School in 1950. After attending Springfield Teacher's College, she taught school for five years in and around Corsica. After teaching, Ruth worked in the Corsica Post Office for 27 years and also gave piano lessons in her home. On June 26, 1953, Ruth married Henry (Doc) Jongsma in the Lefer's home. They made their home in Corsica. They were blessed with two children, Wanda and Mark. Doc passed away on October 30, 2017. She was a lifetime member of the Harrison Christian Reformed Church where she attended Ladies Aid, taught Sunday School, was involved with Crossroads Prison Ministries and played organ for over 50 years. Ruth Jongsma passed away on November 27, 2018 at the Good Samaritan Society in Corsica at the age of 87. Ruth is survived by her daughter, Wanda (Randy) Landhuis, Leota, Minnesota, son, Mark Jongsma, Sioux Falls, SD, and two grandsons, Jeff (Carmen) Landhuis, Sioux Falls, SD and Todd Landhuis, Luverne, MN, sister, Muriel (Howard) Hooyer, Grand Rapids, MI, and sister-in-law, Darlene Lefers, Corsica, SD. She was preceded in death by her parents, Harm and Hulda Lefers, husband, Henry (Doc), brother, Earl Lefers, and sister and brother-in-law, Aletha and Ted Maas.